Teen suicide rates in the Kansas City Metro area have spiked in the past few years, outpacing the national average. What’s happening? And how can we help prevent these tragic losses? Increasingly, school and mental health officials in the area are turning to young people themselves for answers. On February 28, 2019, American Public Square and KCUR 89.3 presented a discussion on teen suicide prevention in the KC Metro area and beyond. Panelists examined contributing factors, warning signs, affected communities, and prevention and treatment strategies. KCUR 89.3’s Laura Ziegler presented special reporting, and after the panel program, a community resource fair featured groups dealing with and providing services around youth suicide. Looking for Resources? Click Here. Several organizations hosted information tables at Lifelines: Preventing Teen Suicide. Click on a link to learn more about that organization. Sean Joe is a nationally recognized authority on suicidal behavior among African Americans. His research focuses on Black adolescents’ mental health service use patterns, the role of religion in Black suicidal behavior, salivary biomarkers for suicidal behavior, and development of father-focused, family-based interventions to prevent urban African American adolescent males from engaging in multiple forms of self-destructive behaviors. Working within the Center for Social Development, Joe has launched the Race and Opportunity Lab, which examines race, opportunity, and social mobility in the St. Louis region, working to reduce inequality in adolescents’ transition into adulthood. Joe served on the board of the Suicide Prevention Action Network (SPAN USA), the scientific advisory board of the National Organization of People of Color Against Suicide, and the editorial board of Advancing Suicide Prevention. He is the founder and director of the Emerging Scholars Interdisciplinary Network, a national interdisciplinary and multi-ethnic professional development network for early career social and behavior scientist. Kimberly H. McManama O’Brien, PhD, LICSW, is a research scientist at Boston Children’s Hospital and Education Development Center, and Assistant Professor of Psychiatry at Harvard Medical School. Dr. O’Brien received her BA from Harvard University, MSW and PhD from Boston College, and completed a NIAAA T32 postdoctoral fellowship at Brown University’s Center for Alcohol and Addiction Studies. Her work focuses on the development and testing of brief interventions for suicidal adolescents with and without substance use and their families, with an additional specialization on interventions which utilize technology. Her research also involves training social workers and other health professionals in suicide-and substance-related knowledge and brief interventions. Dr. O’Brien is currently funded by NIAAA to develop and test a brief alcohol intervention and mHealth booster for suicidal adolescents. She is also co-developing and testing a smartphone app intervention for adolescents at risk for suicide, as well as a social media intervention. Dr. O’Brien is a co-investigator on two other NIMH-funded studies; one is examining factors that lead sexual minority youth to have higher rates of suicidal and non-suicidal self-injurious behaviors, and the other is developing and testing a novel suite of simulated suicide risk assessment trainings. In addition to her research and teaching experience, Dr. O’Brien is the founder and director of the school counseling program at Charles River School, a private school for grades Pre-K to 8 in Dover, MA. and the LGBTQ Liaison Officer for the KCPD. Dr. Todd White is a skilled educational leader with more than 30 years of experience in education. White assumed the role of Blue Valley Schools Superintendent in the spring of 2016, making him the seventh superintendent in district history. He leads the district’s strategic efforts for unprecedented academic success and unparalleled personal growth for every student. White describes his leadership style as team-centric and believes that student success lies in the immensely talented group of people who make up the Blue Valley Schools. It is this spirit of collaboration and teamwork that has resulted in White’s proven track record in education. His experience in educational leadership includes a combined 13 years as a superintendent for the Harrisonville School District (2,500 students) and North Kansas City School District (19,500 students). Under his leadership, rapid improvements in student achievement and graduation rates earned him the Missouri Superintendent of the Year (MIPA) in 2015 and Outstanding Superintendent in 2013 from the Missouri Association of School Administrators (MASA). His reputation for success also earned him accolades from the community. White was named a 2016 Outstanding Superintendent in the first annual Speak Up Shout Out Awards for the district’s exceptional participation in the Speak Up Research Project for Digital Learning. In 2014, he was awarded the Richard Noll Award of Excellence in Government Service by Northland Neighborhoods, Inc. for his understanding that strong neighborhoods build strong schools. White was also named the 2015 Missouri Interscholastic Press Association Administrator of the Year for providing outstanding service to journalism. Brian Ellison is a host of KCUR talk shows, podcasts and live community events. He is regular substitute host of Central Standard and Up to Date and hosted the political podcast Statehouse Blend Missouri. He also contributes to the station’s news coverage, including political reporting, anchoring election night broadcasts and conducting interviews for KCUR’s Morning Edition. He has moderated panel discussions in partnership with American Public Square, anchored live statewide coverage of Missouri political events, and appeared frequently on NPR’s Here and Now. An ordained Presbyterian minister, Brian is also executive director of the Covenant Network of Presbyterians, and a regional administrator for Presbyterian churches in Kansas and Missouri. “In the past year, there were more than twice as many suicides in the United States as there were homicides”(1). Suicide rates for teens, nationally, have risen at a significant rate, making it the second leading cause of death for 10-34 year-olds (2). The suicide rate for Missouri youths, ages 15-19, increased 63% between 2006-2017. For Kansas City, MO youths, suicides for this age group have nearly tripled (3). Moreover, the teen suicide rates for both Missouri and Kansas surpass the national rate of 8.9* for 2018 (Missouri, 12.8; Kansas, 11.6) (4). Eight Johnson County youths took their lives in 2017. “It’s not just a school issue,” Superintendent DeWeese said. “It’s not just a mental health issue. It’s a community issue (5). In Kansas City, MO, 33 youths, ages 10-19, took their lives between the years 2010 and 2017. Of these deaths, 18 were white, 11 were Black and African-Americans. This reflects the proportionality of white to Black teens in the city. Of the 33 deaths, 10 were female, 23 were males**(6). In 2017 alone, the Jackson County Medical Examiner’s office investigated 11 youth suicides between the ages of 14-17 years of age. Of this group, eight victims were white, three were Black and African-American, seven were male, and three were female (7). The 2018 Missouri Student Survey (MSS), which includes sampling from Kansas City schools, revealed that 14.1% of students surveyed had considered suicide while 10.9% had made a plan to attempt suicide (8). The data showed “Caucasian students were more likely to report considering and planning suicide in the past year while African Americans were most likely to report an actual attempt” (9). For the larger Jackson County, the MSS reported 9th and 11th graders had the highest levels of thinking about and planning suicide in the past year (10). Firearms were the most common method of suicide. Males are “more than twice as likely to die by suicide. Males also have much higher rates of using firearms which may explain why their overall rate is so much higher than females”(11). General causes of teen suicide are provided below and can apply to any and all races and ethnicities. In an older study done in the 1980s and 1990s, factors also shown to contribute to suicide of Black teens were drug use, the “breakdown of the family,” and the pressure to “achieve middle-class success” (12). A study of Kansas City Hispanics found that suicide is now the third-leading cause of death among Latino youths. Challenges for this population include lack of access to mental health care, lack of health insurance and acculturation issues (13). Fifty percent of respondents noted “poor mental health of community members” as a challenge (14). In a middle school focus group in the St. Louis area, four out of five girls admitted knowing a friend or relative who attempted to commit suicide (15). The Missouri Assessment of College Health Behaviors (MACHB) found “LGBTQ college students were more than two times more likely to have had suicidal thoughts than non-LGBTQ students, and were almost five times as likely to have made a suicide attempt (41% vs. 18%)” (16). The GLSEN School Climate Survey of high schoolers found that “Most LGBTQ students in Missouri experienced anti-LGBTQ victimization at school. Most never reported the incident to school staff (51%)” (17). “Suicide does not discriminate based on social status, level of celebrity, financial status, race or gender,” said Johnson County Mental Health Emergency Service Director, Rob McDougall” (18). The causes of suicide are multifactored. Causes can vary by race/ethnicity and socioeconomic status. In general, suicide is often the result of one or several underlying depressive disorders or mental health conditions combined with stressors in a person’s life. For teens, experts cite bullying, cyberbullying, drug dependency, youth impulsiveness, financial concerns, dysfunctional families, failure to acculturate, relationship problems, or loss of a close friend or relative to suicide as contributing factors. Even the best and the brightest young people fall victim to real or perceived pressures to be perfect and to excel (19). ** Due to confidentiality rules, precise numbers of suicides for given years or categories of race, ethnicity or gender cannot be shared with the public. Ranges of years allow for the aggregation of data to make it more shareable. A Data Brief. Jackson County Health Department. July 2018, p.2. (Data source: National Institute of Mental Health). LINK. 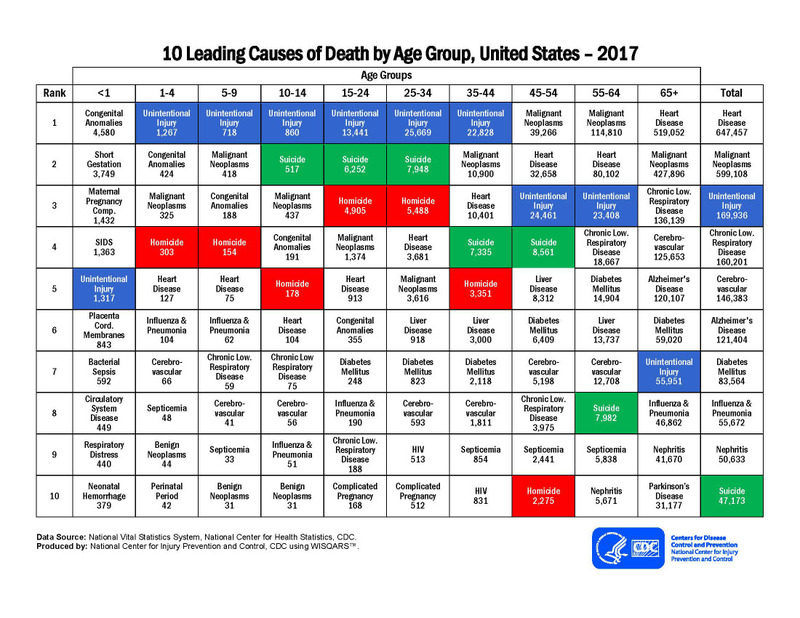 “Ten Leading Causes of Death by Age Group, United States 2016.” National Center for Health Statistics and National Center for Injury Prevention and Control. Link ; and “Ten Leading Causes of Death by Age Group, United States 2017.” Link. Trend Analysis-Missouri Resident Self-Inflicted Injury Profile, Missouri Department of Health and Senior Services, February 9, 2019. LINK. Data is presented as three-year moving averages – Year range 2006-2008 = 6 suicides; Year range 2015-2017 = 17 suicides. See also America’s Health Rankings, United Health Foundation. “Underlying Cause of Death, Multiple Cause of Death files”; Data source: CDC WONDER Online Database. LINK . America’s Health Rankings United Health Foundation. LINK. There were 6 suicides among the 5-14 yr-old age group. ^See also “Kansas: Annual Summary of Vital Statistics 2017.” LINK. Bergen, Katy. “‘Enough is enough:’ Johnson County superintendents unite to fight teen suicide” Kansas City Star, 6 August 2018. LINK. “Death.” Missouri Public Health Information Management System (MOPHIMS). Department of Health and Senior Services. LINK. Whites comprise approximately 65% of the teen population in Kansas City, MO; Blacks comprise 14% of the teen population. LINK . “Jackson County’s Medical Examiner’s Annual Report 2017,” p.31. LINK. Note: the greater metro area covered by the Jackson County Medical Examiner’s Office includes Jackson, Clay, Cass and Platte and some extending areas. While the Medical Examiner’s office does not investigate all deaths that come to the office, it did investigate a total of 238 suicides in 2017. Missouri Student Survey. 2018 Report. Link9. Missouri Student Survey. 2016 Report, LINK 31. Missouri Student Survey 2018, data query, February 6, 2019. “Suicide Rate Among Black Youths Rises.” Kansas City Star, 20 March, 1998, A2. “Latinos Need Better Access to Mental Health Care.” Kansas City Star, 24 June, 2008. B1. LINK. More causes may be found in the report cited: Fuger, Kathryn L. “2013 Greater Kansas City Hispanic Needs Assessment” UMKC-Institute for Human Development, March 2014. Fuger, Kathryn L. “2013 Greater Kansas City Hispanic Needs Assessment” UMKC-Institute for Human Development, March 2014. p. 79. LINK. Adler, Eric. “In a bright new land, dark thoughts emerge.” Kansas City Star, 17 April 2006. “Suicide in Missouri: Where We Stand.” Missouri Institute of Mental Health. August 2018, p. 2. LINK. GLSEN 2017 School Snapshot- School Climate in Missouri. LINK. Mattie Rhodes report , “Closing the Mental Health Gap: Eliminating Disparities in Treatment for Latinos” The Mattie Rhodes Center with support from Department of Health and Human Services, LINK; Abigael and David Harris “Johnson County teen suicide report coming out.” KCTV5, 16 November 2018 LINK ; “Examining Suicide in Eastern Jackson County – Data Brief.” Johnson County Health Department, July 2018. LINK ; Rick Montgomery, Mará Rose Williams, and Kelsey Ryan. “Teen suicides are reaching record highs, forcing schools to ‘break the silence.” Kansas City Star, 10 December 2017. LINK; Kuehl, Sherry. “The Teen Suicide Epidemic in Kansas City,” 435 Magazine, May 2018. LINK.